Bring beauty and function to your living space with the handcrafted Amish American Mission Magazine Rack End Table. Keep your reading material within arm's reach as you relax and unwind. Choose from solid oak, cherry, quartersawn white oak, or brown maple to have your end table made in. 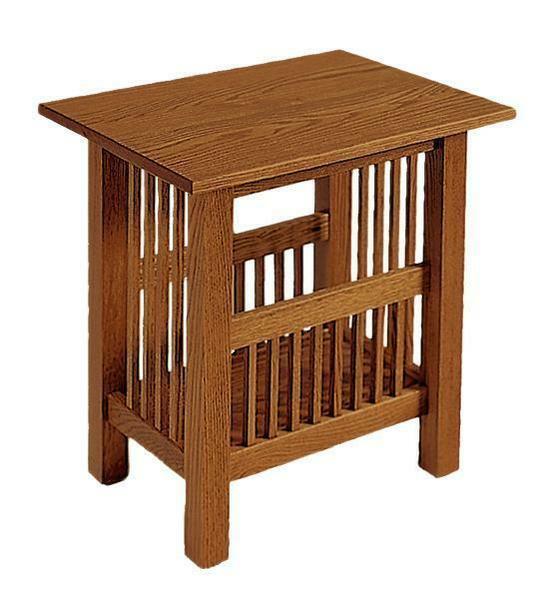 With handcrafted construction and American sourced hardwood, you simply cannot go wrong with the Amish American Mission Magazine Rack End Table. Be sure to check out our Mission End Table and Mission Coffee Table to complete the transformation of your living room furniture or reception room furniture. Feel free to give us a call at 866-272-6773 to speak with a friendly DutchCrafters expert who can answer any and all of your questions. Thank you for shopping with us! Finally, I received my Walnut rocker and magazine stand yesterday. And, even after the long wait it was worth it! Both items are absolutely beautiful. So much better than trying to visualize a photo. Thanks. I ordered an Amish Mission Magazine End Table earlier this month and received it today. I was amazed at the finished product. You can't buy quality furniture like this in a local furniture store. I know, because I looked. It was packed better than expected without any damage. I've ordered furniture online before and it was never packed this well. I will be ordering more furniture from you in the future and look forward to receiving my curio cabinet and DVD/VCR cabinet soon.